As you all know, I am a dad, and I love magic, so of course, I highly support, and am very enthusiastic about, the following event. I’ll be there, so come by and say hello! 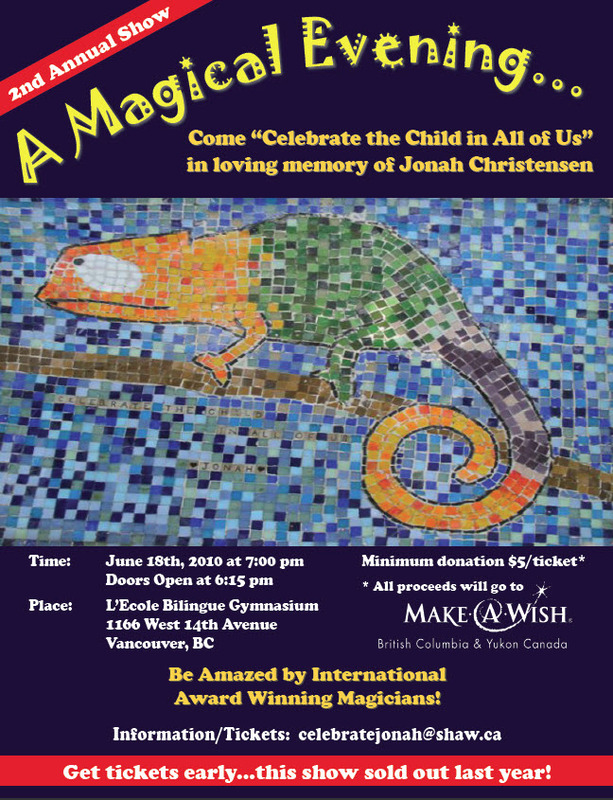 If you live in the Vancouver area, come be amazed by international award winning magicians who will be performing on Friday June 18th @ 7pm at L’Ecole Bilingue Gymnasium 1166 West 14th Ave in Vancouver. This is a family-friendly event, and all money raised goes to the BC/Yukon Make A Wish Foundation in memory of Jonah Christensen. Doors open at 6:15 and the cost per ticket is a minimum $5 donation. 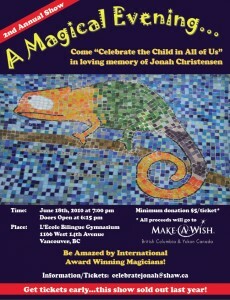 For more information/tickets contact us at celebratejonah@shaw.ca. Get your tickets early as this show sold out last year! Location: L’Ecole Bilingue Gymnasium, 1166 W. 14th Ave Vancouver, BC. Phone: 604-713-4585. Come on out, highlights include Matthew Johnson, Trevor and Lorena as well as the Chow family.